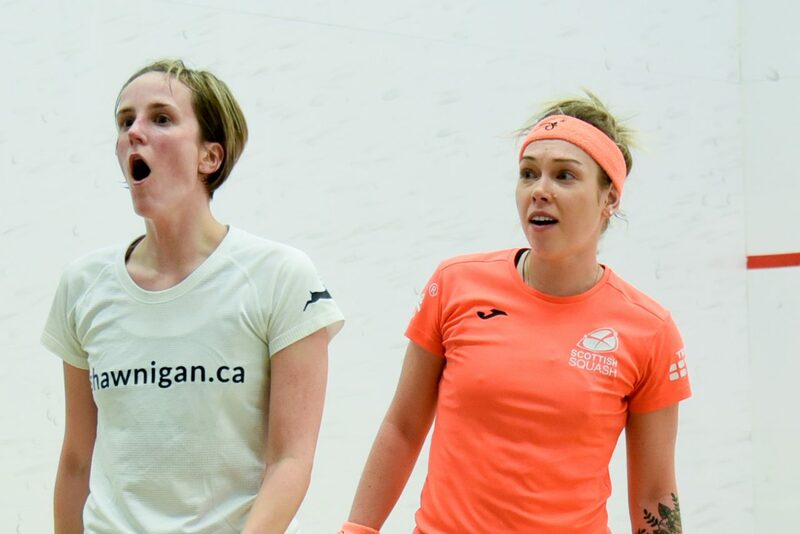 Canada’s Hollie Naughton produced a superb display to join the top four seeds in the quarter-finals of the Cleveland Classic. Seeded in the 9/16 bracket, she overcame No.8 seed Nadine Shahin of Egypt with a measured performance in the fifth game between two players demonstrating contrasting styles of play. Most of the top seeds looked more comfortable, with Nour El Tayeb winning in straight games against Malaysia’s Rachel Arnold although No.2 seed Tesni Evans had some moments when she struggled to maintain her normally dominant levels of performance. Samantha Cornett battled hard against England’s Alison Waters and, after winning the second game to draw level, she slugged it out in the third before Waters scraped through 16-14. As Cornett fell off the pace, Waters quickly opened a 5-0 lead in the fourth and withstood a fightback to book her place in the eight. Any England-Scotland encounter is likely to be fiery and feisty, and that’s exactly how it was before Victoria Lust overcame Lisa Aitken in 12-10 in the fifth. Very hard-hitting game between the left handed Canadian and the right handed Egyptian. Nadine adopts a ferocious hard-hitting game on Hollie’s back hand and reaps immediate results. Naughton adapts a little too late stealing 6 points. Game ends 11-6. Game two: Nadine continues her slogging down the backhand, but Naughton is well aware of that threat and does a great job to absorb the pace and uses it against the marauding Egyptian. Naughtons game plan works, game 2 ends comfortably 11-6 to Naughton. Game three: Nadine convinces herself early in the 3rd to up the tempo. Naughton settles in for the onslaught down the right wall and focusing on limiting her errors. Lobs and drives are the order of the day and the Canadian again out foxes the hard-hitting Egyptian. 11-8 Naughton. Game four: Credit to Nadine, very confident in her hard hitting from the previous game, more of the same in game four. This time Naughton succumbs to the pace and makes a series of costly errors that cost her the game. 11-6. Final game is the same as the previous games. Naughton is slow and calculated, Nadine is fast and furious in her shot making and court movement. Fatigue is now a factor and the slower and more calculated Canadian wins the day with a an 11-6 victory in the 5th. Arnold does not do much wrong in the first game. Moves well and picks good lines around the court but Nour is clinical with length and solid defence. Arnold desperately searches for openings. Tayeb shuts down that mid court area well, not allowing much to sail into the back. Arnold is stretched and scrambles for good defensive positions. Tayeb won’t give her that time and closes out the game 11-3. Arnold, aggressive off the serve in game three, takes a quick 7-3 lead. Tayeb plays herself back into the game, nipping at Arnold’s heels all the way to a 11- 8 victory. Game 1: Tins and nicks. Fast paced game, with both players jostling for the T, but failing to convert the pace into points. Miriam with a bit of momentum steals the lead for a 7-6lead. Aumard, rallies and finds good rhythm to steal game one 11-8. Game 2: Master-class in backhand attack from the Egyptian. A finely concentrated backhand attack game give Aumard very little to work with. Game end 11-2 in the Egyptian favor. Game 3 Aumard worked hard for not much in the 2nd. The start of third is a battle with Miriam throwing everything at her opponent. Aumard battles but leaves it a little too late to mount a complete come back. Game ends 11- – 8 to Miriam. Miriam starts of game 4 very confidently, amassing a quick 10 points to set up match ball. Aumard battles to 7 – but that’s all the Egyptian will give up today, game ends 11-7 to Miriam. Great composure and execution gives Hany a strong lead, 10-3. Landers Murphy takes one more point before Hany closes game one 11-4. Game 2: Murphy does well to assert herself defensively in game two. Hany remains dominant in the attacking department but has a hard time converting that dominance into points. Murphy is rushed, not much time to setup attacking plays. 11-7 Hany. Game three goes the other way for Hany. Murphy doing better job with the short ball off good length, finally exposing too many gaps in Hany’s defense. 11-4 to Murphy. Game 4 is definitely a response to events in game 3. Hany comes out firing, takes a 9-3 lead before Murphy takes 5 quick points to a respectable 11-8 final score to Hany. Emily sharp and steady. The aggressor in attacking. Goes from 6-1 then 11-4. Nele attacking better 4-3. Very nice squash from both. Back and forth to 8-6 Nele. Emily pulls even to 8-8, but then Emily on fire. 11-9, match to Whitlock. Both players attacking. Sam makes an impact but Alison too good. 11-4. Sam come out firing and leads 6-2. Alison reels her in 8-9. But 2 good points by Sam give her the second game 11-9. Alison focused but Sam giving her all 7-7, 10-10 great points! This is a heavyweight match. 16-14 to Alison. Sam lost her grip in the fourth and Alison won the first five points. Sam rallies but it’s too big a gap. 11-6 match to Alison. Lisa out early 5-2. Both players very physical. Lust fights back to 7-8. Then quickly to 11-9 Lust. Aitken again out to early lead 7-3 in the second. This time she hangs on 11-7. Third game: Aitken picks up where she left off 6-0. Exchanges points to an 11-5 win. Fourth game is even until Lust breaks free from 4-4 to 11-5. Both come out playing to win in the fifth. Even more contentious at 6-6. Lust out to 8-6. Aitken back to 8-8. Finally, 12-10 and match to Lust. Letourneau gets an early lead but Evans powers through 11-9. Evans running hot and cold in the second but wins two points from 9-9 to go two up. Evans goes walkabout as Letourneau builds a 5-1 lead in the third. She stays in front as Evans responds to win it 11-8. In the fourth game looks Evans out of sorts early on. But turns up the heat. Game and match to her 11-7. PSA W50 Women’s $51,250 Cleveland Classic 2019, Cleveland Racquet Club, Cleveland, Ohio, USA.